Extreame Savings Item! Free Shipping Included! Save 43% on the Win Power PSX24w / 5202 Fog Light H16 Led Headlight Bulb Conversion Kit Dual Color For Jeep Grand Cherokee Wrangler Trucks Cars DRL Lights Kit Replacement Bulb 3000K Yellow 6000K White (Pack of 2) by Win Power at Kart Racing Network. MPN: WP-FL-5202. Hurry! Limited time offer. Offer valid only while supplies last. ★Halogen bulb replacement:This upgrade your 5202 halogen bulb to LED, 3000K YELLOW and 6000K WHITE dual colors in one bulb, easy to change color by turning the fog light off and turning on again, yellow light suits for foggy, rainy or snowy days and white light for DRL. ★Buy with confident:Our WinPower 5202 Led Headlight bulb come with decoder which is suitable for most of the 95% vehicles. But with some sensitive monitor may still experience flickering, error code.If you meet this problem, please contact with us to help you work it out. We offer 12 months warranty. 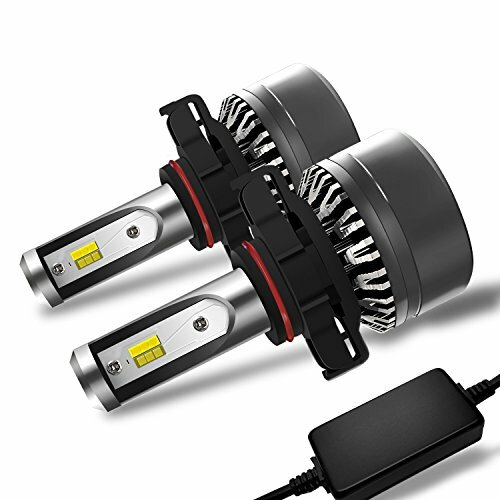 ★Powerful Cooling system,Aviation Aluminum housing, high speed turbo cooling fan, insert EMC Intelligent temperature control system, this 5202 led kit made with advanced cooling material and high heat dissipation structure to ensure bulbs working working over 50,000 hours. ★Easy Installation: This 5202 / H16 Fog light just Plug and play. Some of ordinary 5202 led bulbs are too big/long to install, this led bulbs has size improved that can be perfectly installed on most vehicle without replace a deeper dustproof cover.Can be installed in 20 minutes. ★Buy Right Size Bulb:Please double check before ordering, check your vehicle owner's manual to confirm which size bulb for your desired application (low beam, high beam, fog light). Or please contact with us, we can hlep you check it out. If you have any questions about this product by Win Power, contact us by completing and submitting the form below. If you are looking for a specif part number, please include it with your message.